Optimized Dolphin Hosting With 1-Click Install. We'll register a new domain or transfer your existing domain free of charge with all AVS hosting plans. Domain names will renew at the regular rates after the initial year. Switching to us is easy! We'll move your entire Boonex Dolphin website from your current host hassle free. Host unlimited individual websites on all of our hosting plans. Install multiple instances of Dolphin with ease. Create unlimited email addresses with IMAP and POP3 support. Install Dolphin with our 1-click installer and have your site online in minutes! Our CSF firewall will protect your Dolphin website from login attempts and other malicious activity. We host thousands of Boonex Dolphin websites and can help you navigate Dolphin if you need a hand. We're sure you'll love our Dolphin optimized hosting but just in case we'll give you a full refund within 30 days. Install, Customize and Manage Dolphin With Ease! With our 1-click Dolphin installer you can literally have your Dolphin website online within minutes. 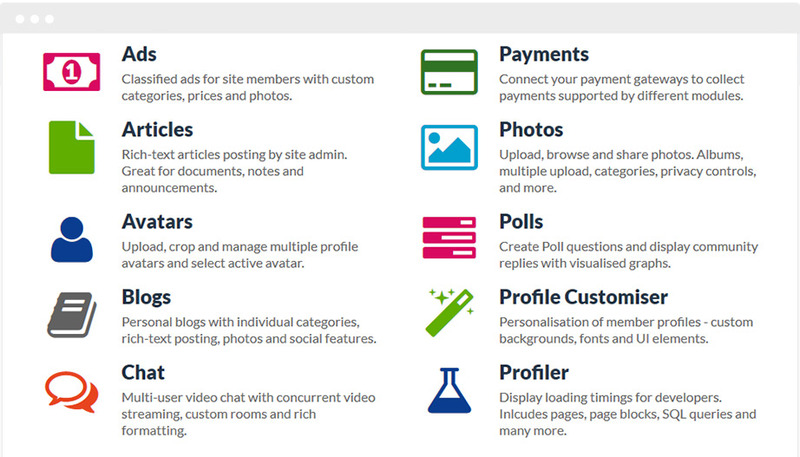 Using the Dolphin Admin Panel you'll be able to manage your Social Network with ease. What version of Boonex Dolphin is included? Our 1-click Dolphin installer uses the latest and most current version of Dolphin available directly from Boonex. Do your plans include RMS? No, we no longer offer RMS however this is not required to run Dolphin. Can I upgrade between Dolphin Hosting plans? Yes, you can switch between hosting plans at any time and our prices are pro-rated meaning you simply pay the difference of the new plan. Upgrades are instant between Dolphin hosting plans and there is no downtime. Do you offer or sell Dolphin licenses? Dolphin licenses must be purchased directly from Boonex. We offer a free 1-click install however licensing is done by Boonex themselves. How does the 1-click Dolphin installer work? Inside your cPanel hosting control panel you'll see a Dolphin icon. Once clicked you can click 'Install' and will be guided through the steps to install Dolphin on your domain name. "We use HostUpon for our Music DJ social community here in the U.K. HostUpon was recommended by Boonex themselves so I knew I was going to be in good hands. Superb support and everything works as promised. Our social community is growing and HostUpon has been the backbone for us." Ross Temple, Music Industry - Manchester, U.K.